The Dominance of the City. Ora Coltman, 1933-34. 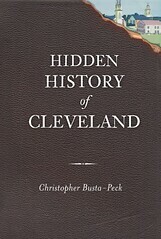 Image used courtesy of Cleveland Public Library. The large center panel shows a view of bridges over the Cuyahoga River in the Cleveland flats. The artist's intent was "to glorify the genius of Cleveland which contemptuous of the obstacles of the river and its valley, had thrown across it these broad level highways making one community out of two, the mercantile east side…linked up with the south-side foreign residents. " The right panel of the mural shows the St. Theodosius Cathedral and its surrounding Tremont neighborhood. The left panel is the Ohio Bell building representing Cleveland as a center of commerce. Detail, The Dominance of the City. Ora Coltman, 1933-34. Image used courtesy of Cleveland Public Library. My attention was drawn to the right hand panel, illustrating St. Theodosius Russian Orthodox Church. It reminded me of another painting of the church and the Flats, painted in 1912 by Frank Nelson Wilcox, which I discussed in Caboose and Russian Church. The historic church remains today, while many of the houses around it are gone. But that's not the most significant change in the appearance of the church. In these paintings, the church is portrayed as sitting at the very highest point in the landscape, while the viewer is placed in the Flats. In such an elevated position, it is impressive, and suggests grander things. Today, most of those who view the church see it from Interstates 90 and 490. They're (physically) closer to the position of the church, and as a result it loses something of what makes it impressive. Little Russia, Cleveland. Ora Coltman, 1926. Image used courtesy of Cleveland Public Library. 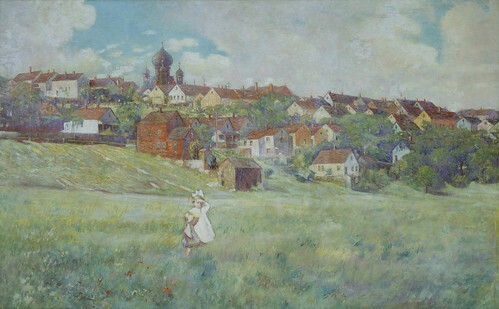 This can be seen in a lesser degree in Coltman's Little Russia, Cleveland, painted for the Jefferson Branch of Cleveland Public Library. Am I saying that we should remove the interstate highways for a more appropriate historical landscape? No. I bring this all up to suggest that we can better view the landscape as a whole (and the significance of this church within the community) by visualizing the landscape around it at the time it was built. Imagine yourself in the Flats in the 1910s and try to see what the visual impact of this church must have been. It's interesting too that the painting chooses St. Theodosius, several major bridges over the Cuyahoga and the Ohio Bell Building as its landmarks, ignoring the recently-completed Terminal Tower, which with just a slight shift to the right in the center panel could have been included! Perhaps the choice was one of composition. For whatever reason, Coltman chose include some smaller commercial / industrial buildings in front of the Ohio Bell structure. This may have been to suggest the growth of smaller businesses into more massive enterprises, or to suggest a city that was on the rise. Perhaps, in the panel that includes St. Theodosius, he was trying to suggest the relationship between man and god, or the one and the many, with the houses and the church in the background. Whatever the reason for the relationship in the panel that includes St. Theodosius, it seems that the opposite panel was designed to mirror it. Thus the choice of the Ohio Bell building rather than the Terminal Tower might simply be a composition choice - the Terminal Tower is too tall for the effect that Coltman was looking for. There are two paintings that Ora Coltman made of the gate to Erie Street Cemetery, with the Ohio Bell building in the background. In both, the gate is more vibrant, while the Ohio Bell building is in more of a haze. They're pictured in "Transformations in Cleveland Art". Including the Terminal Tower in the center panel would have been contrary to the point of the painting. If I understand correctly, Coltman's intent was to show the east and west sides (represented by the two side panels) joined by the collection of bridges spanning the river valley - commerce and community united by engineering triumphs. I lived in the projects on west 5th st. and went to the Jefferson branch also. I don't remember this painting, but I know it was painted long before we lived there. We lived near St. Theodosis in the projects. I miss the old neighborhood, riding my bike down to the cuyahoga river, the friendlier easier life.